The expedition group excavating the city of Tigranakert built by Armenian King Tigran the Great (1st century) in Karabakh faces financial problems that threaten continuing the project started in 2005. The Government of Armenia has refused its request for state support. “We even addressed Prime Minister Sargsyan to get financing, but the letter was sent to the Ministry of Finance, which replied there are no means [for that purpose]. We have even appealed to the Union of Businesspeople, Hayrusgazard (Armenian-Russian Gas Industry) and VivaCell but have not received a response. Today our authorities and even the Academy [of Sciences] have adopted an indifferent posture,” says the head of the Artsakh archaeological expedition group of the Institute of Archaeology and Ethnography of the National Academy of Sciences Hamlet Petrosyan, who believes Tigranakert is not only a monument and a history with culture, but also a serious bone of political contention. The idea for the search of Artsakh Tigranakert belongs to the chairman of the Yerkir Union Sevak Artsruni, who, led by travelers’ stories about an old city in the neighborhood of Martakert, appealed to the Institute of Archaeology to start a research. “When they offered me the work, I had concerns the evidences would be very mythical,” recalls Petrosyan, adding despite his concerns he formed an expedition group of 5 or 6. Studying the Armenian sources, they found data that say there have been 6 cities named after Tigran the Great, one of them in Artsakh. It was Tigran the Great’s empire that included also the neighborhood of Khachenaget River in Artsakh (Artsakh is the ancient name for Karabakh). “As the first step we made a map of the locale. We discovered an early medieval castle on the bank of Khachenaget. We found also a temple on the top of Vankasar that was built in the 7th century. But we found after gathering the materials the settlement existed in the 5th-9th centuries, therefore Tigran the Great could not have built it,” tells Petrosyan claiming that Azerbaijanis had re-built temple, removing traces of its Christian origins. However, the expedition found Armenian inscriptions – facts refuting the Azerbaijani arguments. The expedition has also made research in Shushi, where it found more than a dozen of khachkars of 12th-13th centuries and a castle. Excavations were done also in the Monastery of Havlaberd in Karvachar with Armenian inscriptions on its tiling. 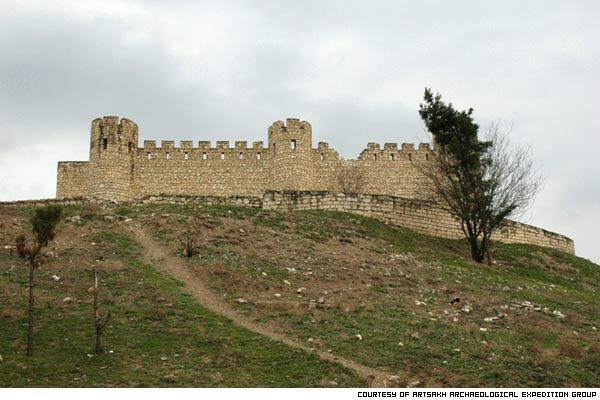 Moving to the other bank of Khachenaget, the archaeologists discovered the true Tigranakert that occupied a territory in 50 hectares and is comprised of a fortified area, trade center and numerous agricultural suburbs. Petrosyan says the city was built on terraces like Semiramis’s hanging gardens. The scientists discovered a citadel on the highest point of the territory and a large fortified district with powerful walls on the slope. The group has so far excavated about 40 meters of the walls that reach 4 meters in height in some places. Lyuba Kirakosyan, the architect in the group says stones of the buildings have been connected to each other with v-shaped joints, which speaks of high craftsmanship in construction. “The construction methods proved what we found was really a city of Tigran’s times and the buildings are erected in the best tradition of Hellenist time technique. It’s an important matter for dating,” says Kirakosyan mentioning the found ceramic artifacts and the rest of the things strengthened the arguments in favor of the supposition the city is Tigranakert. Making sure the city is Tigranakert and having sufficient amount of proof, Petrosyan passed to the main part of the work. “After all our major aim was to spread this information, especially as the government of Azerbaijan tries to distort the information and has even forced the local academy of sciences to come up with special decisions regarding Tigranakert,” says Petrosyan, who has initiated publication of a calendar and a brochure telling about Tigranakert, a city that has survived 14 centuries. The expedition group has organized an exhibition in Geneva and a film show in Los Angeles. Bako Sahakyan, the president of NKR has promised 30 million drams ($97,400) will be allotted to continue the excavations. However, the exact dates are unknown yet. “If, of course, this sum is given, it will suffice for several months of work. But for the moment we have moved the materials of excavations to Yerevan, but there is neither place to locate them nor opportunity to process them,” says Petrosyan.